After you read this review please rank my review with the publisher. Thank you. Steven K. Scott, Author of The Greatest Words Ever Spoken, gives us yet another compelling work in his most recent book The Jesus Mission published by Waterbrook Press. Scott's book The Jesus Mission teaches us that Jesus came to earth with specific missions he had to accomplish in order to save the world. Twenty-seven of them in fact and each one accomplished! It then compels us to take up and accomplish the four missions that he assigned to each of us. It was my great pleasure to read and review this book. Steven K. Scott does a great job of using scripture at every turn in the book. This is not a book of mere opinion but rather a book that shows us scripture and challenges us to do what that scripture is telling us. I LOVED this book and here is why. First of all if you have been following me you know that in my opinion a book that contains little or no scripture can not and should not be called a Bible Study. That doesn't necessarily mean it is a bad book. It could be described as a Spiritual Growth or Christian Life study but not a Bible Study. 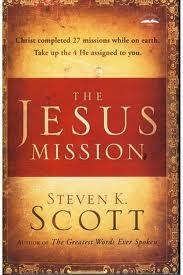 Steven's book The Jesus Mission can indeed in my opinion be called a Bible study. Scripture is the basis for everything in this book. Secondly, the way the book is laid out excited me. It is almost like a "How To" type model. He plainly lays out the 4 mission that Jesus left us with but then he goes a step further by breaking each mission into several "Action Items" so that the reader isn't left wondering how to accomplish the missions. Several of the insights in this book left me with "Aha" moments or sparked other revelations about God that I had never seen before. The biggest of these "Aha" moments was in chapter 6 when Steven talks about that idea that the Salvation process may not look like what we think. He points out that the words confess and believe are two vastly different words and the difference may be leaving people "lost". He is also quick to point out that Jesus never mentioned a formula for Salvation like we see in so many churches today. It definitely leaves the reader with something to think about. Steven also mentions the eleven ministries of the Holy Spirit and other things like being the salt of the earth, how to treat the sheep Jesus has entrusted you with and how to avoid the roadblocks, booby traps and deadly detours to following Christ. I strongly encourage you to read this book and keep it on your bookshelf to read over again and again. This is definitely going to be one of my number one picks for 2013! Read the embedded chapter below just to get a taste of this exceptional book. Click here to go back and rate my review please.